Blacks have the great habit of making it easier for us to find a free and simple gift for virtually all special events. 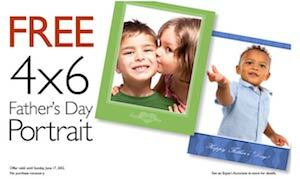 Just like for Valentine’s Day and Mother’s Day, Blacks is now offering a free portrait for Father’s Day to anyone who shows up in-store with their kid(s). Blacks will even take care of printing the picture on one of its colourful themed borders. Sure this deal is a great way to lure customers in, after all Blacks does offer a pretty good selection of digital cameras and photo books, but the cool thing about this promotion is that you have no obligation to purchase anything in order to enjoy it. Just walk in with your little ones, the store’s staff will take care of shooting the photography and printing it, entirely for free. How cool is that? Also, if you’re curious about learning some photography tips, there’s a great section available at Blacks.ca dedicated to offering advice and tutorials on subjects like: “Simple techniques for sharper photos”, “5 easy things you can do to start getting better photos” as well as many other interesting subjects. This resource called Tips & Tutorials is entirely free and should help you learn some more in-depth photography for a couple of hours (if you’re into this kind of stuff that is).